Every doll collector knows that the only thing better than a new doll is new doll space. 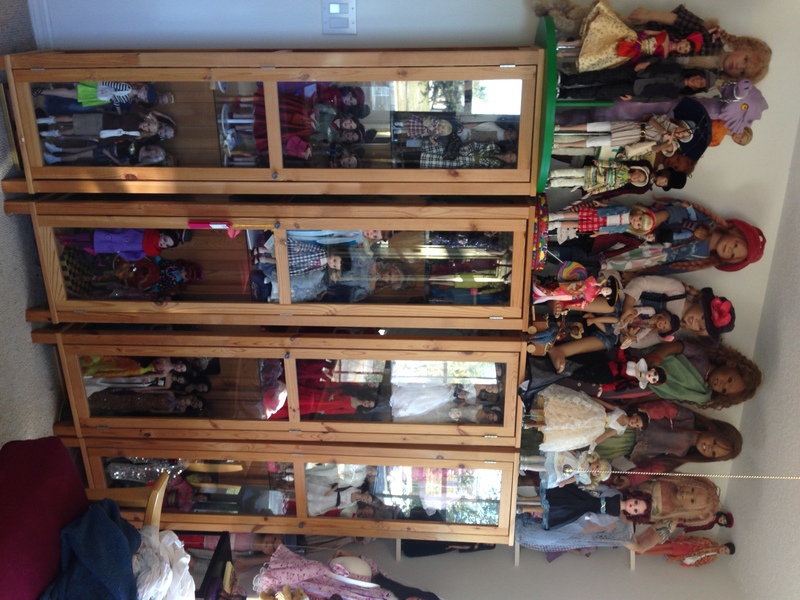 For those of us outside of the 1%, the biggest burden we bear as doll collectors is trying to find space to display the damned things. Dolls, of course, are like potato chips. … You can never have just one. Or two. Or two dozen. Dolls get lonely too. They need friends. And friends with benefits. And spouses. And kids. And mistresses. And extended family. And nemeses. They breed like rabbits. And they need their space. I am one of those lucky people with a “doll room.” Which, for me, means that the majority of my dolls are crammed into our small third bedroom. 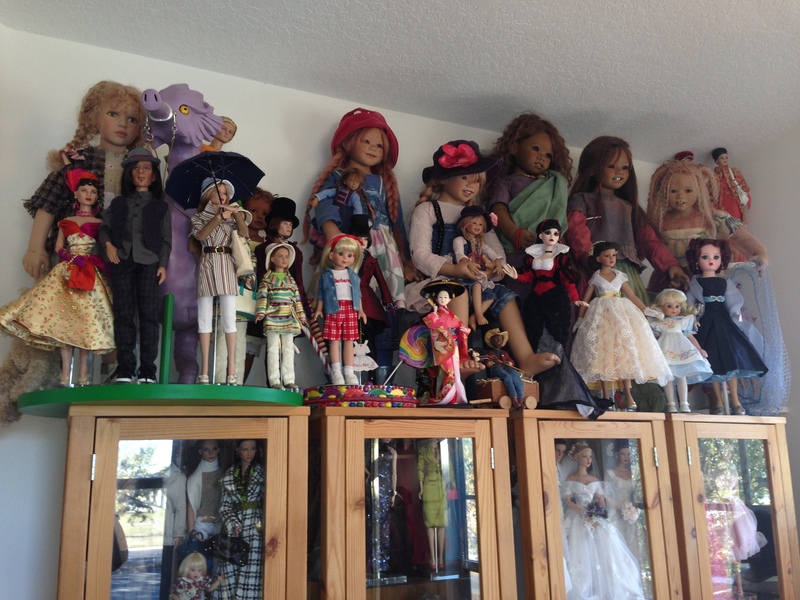 When my husband and I purchased this house–our first–eight years ago, I was delighted to finally have that “grail” that all serious collectors covet–a room of my own designated specifically for my dolls. My husband was more than happy to give this to me. In our former apartment, he slept in a bedroom festooned with dolls, including the 3-foot Himstedt that stood on his bed stand. He took the second bedroom as his “man cave” (which he would have to sacrifice three years later when our son came along, but everyone knows that doll rooms take precedence over man caves). The shelf over the closet makes a great space for Dorothy and her friends. Don’t let those room corners go to waste! If I get on a ladder, I can just about reach this top corner. It would be a crime to let the surface on top of shelves stay vacant. 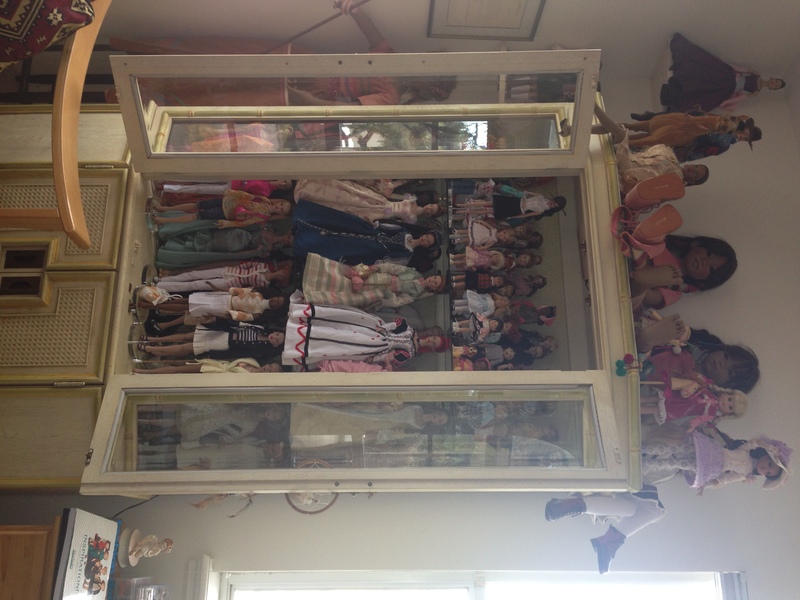 I just about reached maximum doll capacity a few months ago. The one piece of real estate left was a bookshelf that contained a selection of my husband’s large military history book collection. 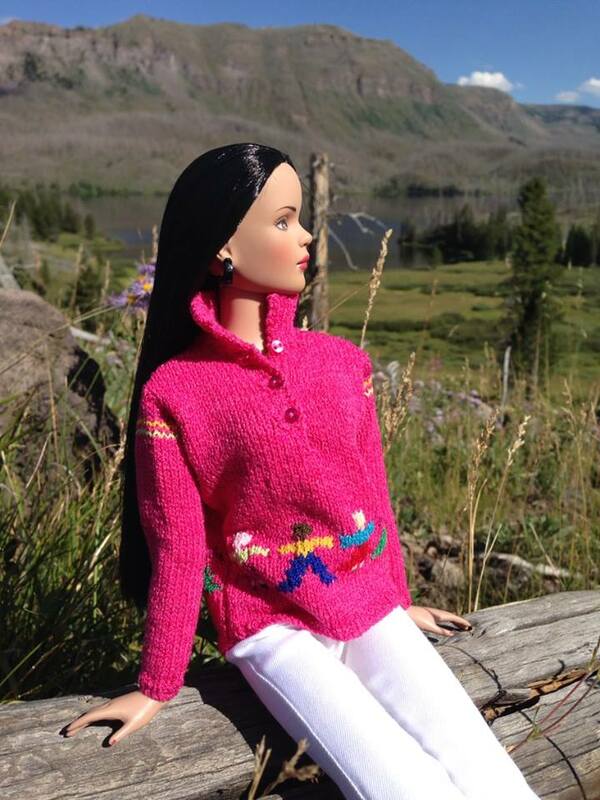 (Doll collectors and military historians share a surprising amount of chemistry.) This was the last remnant of the “man cave” that predated my son’s entrance into this world, and I generally tried to keep my mouth shut about how cool it would be to have that space for the girls who had taken up residence in the garage due to the doll room’s worsening real estate crisis. And then out of the blue the husband tells me he’s rearranging the house and is moving the bookcase elsewhere. It was like hearing that Christmas was coming twice this year. I immediately began to make plans in my mind. I had my eye on a beautiful, tall, long-neglected walnut bookcase in our garage. Its deep shelves could accommodate 16-inch dolls, and I envisioned creating mini dioramas in them. All of the rest of my shelf space was filled to capacity with dolls lined up like toy soldiers. This space would be different–it would be my creative space, my in-progress space, where I would frequently rotate displays. I’ve enjoyed playing with this new space during the past month, and I’m happy with the mini dioramas and small scenes that I’ve created thus far. I recently ventured into the resin fashion ball-jointed doll (FBJD) world, and I now have space to better access and display them. Ellowyne and her friends enjoy the view from their perch. The Integrity girls enjoy an afternoon gossip. Stratus has her own shelf too. Alma enjoys a glass of wine. On her shelf, Tyler helps a client with a new design. The Effner crowd provides the cuteness factor. I am so grateful for this little escape in my little townhouse in my little central Florida town. In this doll space of my own, I escape the sometimes difficult realities of a full-time job in corporate American and an obstinate four-year-old boy who is certain that my function on this earth is to please only him. After I close my computer for the night and tuck the little one into bed, I am able to get creative with my dolls for an hour or two before it’s time to head to bed and face it all again. And that’s why we’re in this hobby, right?